All motor vehicles being driven and moved upon any highway in the state of Pennsylvania are required to be titled and registered by the Pennsylvania Department of Transportation (PennDOT). People living in Pennsylvania who are driving a motor vehicle are required to maintain current vehicle registration to obtain a license plate and drive it on the highway. Vehicles from out of state must be registered and issued license plates before it can be driven in a highway. Owners are required to apply for Pennsylvania title and registration of their vehicles within 20 days of establishing residency in the state. VIN verification is required for out of state vehicles. When registration is complete, license plates shall be issued by the department to be displayed on the assigned vehicle. Registration stickers will no longer have to be displayed since PennDOT will no longer issue Vehicle Registration stickers effective Dec. 31, 2016. For lost, stolen, damaged or illegible license plate, you may apply for a new plate at the Department of Transportation. If the plate is lost or stolen, you must report the loss to the police within 48 hours. License plates may be transferred to another vehicle owned by the registrant or to another vehicle owned by the registrant’s spouse, parent or child. Buying a used car in Pennsylvania? Don’t make a costly mistake. 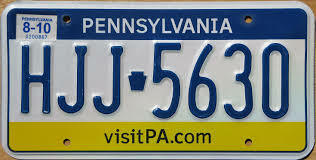 Run a Free License Plate Lookup for your Pennsylvania-registered vehicle! Run a Free Pennsylvania License Plate Lookup to uncover the full-story of your Pennsylvania-registered vehicle.